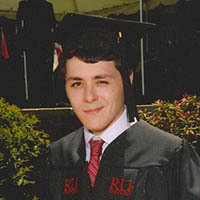 Tucker Ryan Shaheen, 27, passed away Wednesday, March 27, 2019 at his home in Radford. He was a graduate of Radford High School and received his Bachelor’s Degree from Radford University. Tucker was the smiling face and the warm hug that greeted you at Wade’s Supermarket and at the Fairlawn Walmart and will be fondly remembered by many in the Radford community. He was preceded in death by his maternal grandfather, Johnny Hubble. Survivors include his father, Edward (Lisa) Shaheen II of Roanoke; his mother, Pamela Sue Shaheen (Johnny Thompson) of Radford; son, Rylan Chase Gordon Shaheen and his mother, Micaela Gordon of Blacksburg; brother, Jackson Shaheen of Radford; sister, Laken St. Clair of Radford; paternal grandparents, George Shaheen of N.C. and Bette Shaheen of Massachusetts; maternal grandmother, Sybil Whitfield of Radford; and many other relatives and friends. Funeral services will be held at 11 a.m. on Monday, April 1, 2019 at the Mullins Funeral Home in Radford with Rev. Timothy Worles officiating. Interment will follow in the West View Cemetery in Radford. The family will receive friends from 2 until 4 p.m. on Sunday evening at the funeral home. In lieu of flowers, the family requests that contributions be made to the Juvenile Diabetes Research Foundation at www.jdfr.org.